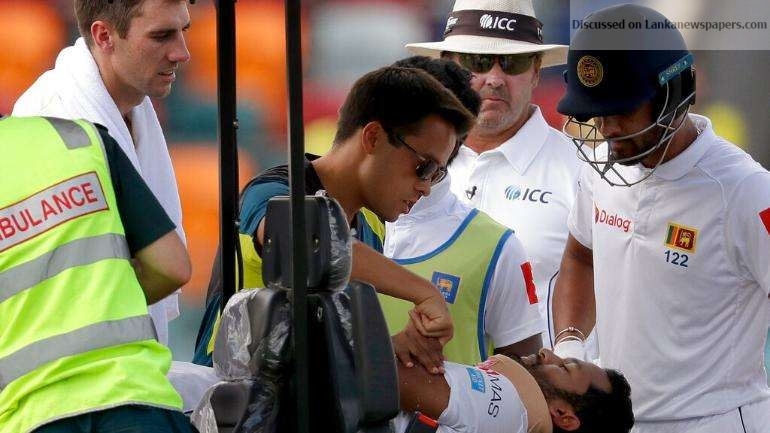 Sri Lankan opener Dimuth Karunaratne was stretchered off in a neck brace after taking a hit from a bouncer by Pat Cummins in the second cricket Test in Canberra on Saturday, the Daily Mail said. Playing in his 58th Test, Karunaratne was 46 not out when the rising ball appeared to glance off his shoulder and onto his helmet, close to the neck area. He slumped to the ground dropping his bat as Australian players ran to assist. A doctor and physio sprinted onto the ground and called for more medics. After some 10 minutes, he was put onto a stretcher and taken off the field on a golf buggy.